#TurningPetrolHeads: Can the Hyundai i30 N take on the Volkswagen Golf GTI and Ford Focus ST? Any car that has the word ‘Nurburgring’ namechecked in its title comes with serious expectations. When it’s a completely new hot hatch entrant from a company not previously noted for performance models, it also comes with a degree of trepidation. Meet the Hyundai i30 N.
That ‘N’ also stands for Namyang, which is Hyundai’s global Research and Development Centre in its Korean homeland. However, the i30 N will be built at the company’s Czech factory and has a very European focus on its driving. To underline this, Hyundai also tells us the N symbolises a chicane on a race track, so you get the feeling they really want this car to impress keen drivers. It also shows they are not looking to merely dip a toe into the hot hatch pool but arrive with a great big splash and upset the established players. Those players include the Volkswagen Golf GTI, Ford Focus ST and upcoming Renault Megane Renaultsport. With a list price of around £24,000, the i30 N is in with a very good shout of putting itself among the class leaders. Of course, there will be some resistance from badge snobs, and the hot hatch class is more guilty of this affliction than most where image is as important for many as performance. By using the halo effect of the Nurburgring, Hyundai is hoping to sidestep that issue and it also has another ace up its sleeve in the form of credible motorsport pedigree. The i30 N is the first road-going fruit of a programme that stretches back to 2013 when Hyundai entered the World Rally Championship. That has brought the firm success and credibility in motorsport circles. The i30 N is in with a very good shout of putting itself among the class leaders. Now, while there isn’t the connection in drivers’ minds between rally cars and showroom models there used to be when Subaru and Mitsubishi couldn’t build Imprezas and Evos quickly enough, there remains a strong link. After all, if you can make a car that survives the rigours of rallying, you should be able to make one that deals with daily driving duties. 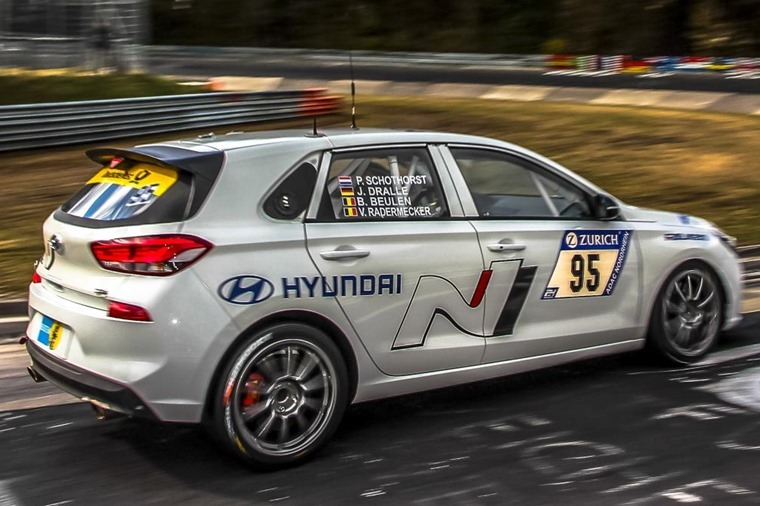 The i30 N has also been subjected to more than 6,000 miles of testing on the Nurburgring. 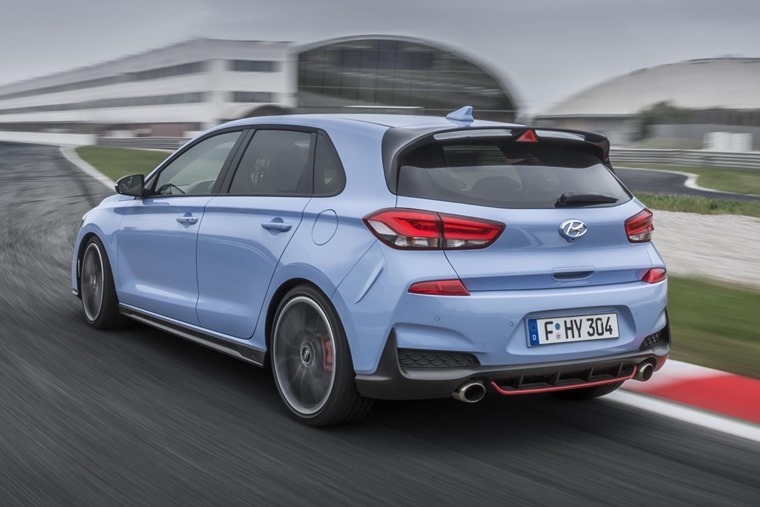 The i30 N has also been subjected to more than 6,000 miles of testing on the Nurburgring, Germany’s toughest race track and one where almost every performance car maker wants to do well. There can be downsides to this, such as chassis settings that err too much on the side of circuit driving rather than road use, but Hyundai has this covered with no less than five modes for throttle, suspension and engine response. Designers have also not gone too extreme with lowering the car as the N sits a mere 4-millimetres closer to the ground than its standard run-of-the-mill siblings. It does hunker down over 18in wheels as standard, with the option of 19s, so it’s still got the looks and attitude a hot hatch must exude. Then there’s the engine. It’s a turbocharged 2.0-litre petrol unit that kicks out 247bhp in standard form. That sees the i30 N from 0-62mph in 6.4 seconds and on to a top speed of 155mph, so figures that are very much on a par with its key rivals. However, customers will be able to up the ante with a Performance Package that raises power to 271bhp and lowers the benchmark sprint to 6.1 seconds, though top speed remains unchanged. Choose the Performance Package and you also gain larger front brakes with red-painted calipers, a Variable Exhaust Valve System and Electronic Limited Slip Differential to make sure all of the power reaches the road without overwhelming traction or upsetting the car mid-corner. 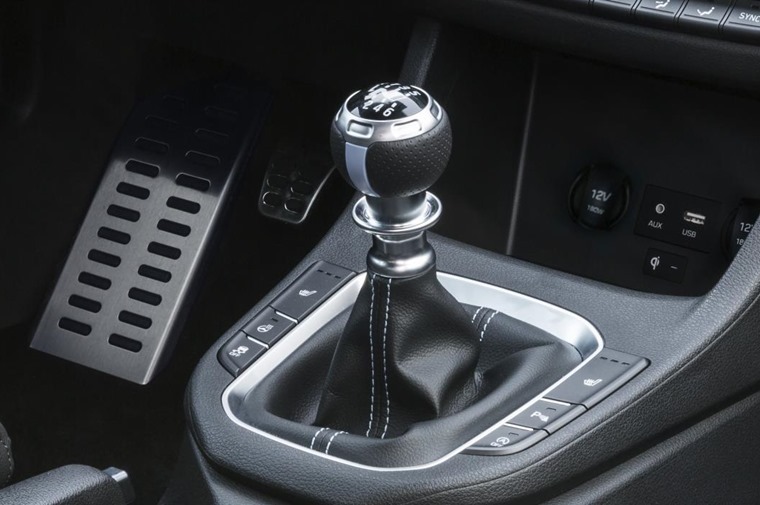 It's all very positive stuff, but perhaps as encouraging as anything else is the fact Hyundai has stuck with a six-speed manual gearbox for the N. In world increasingly moving towards dual-clutch paddle shifters, a plain old clutch and gear lever set-up might seem like a backward step. 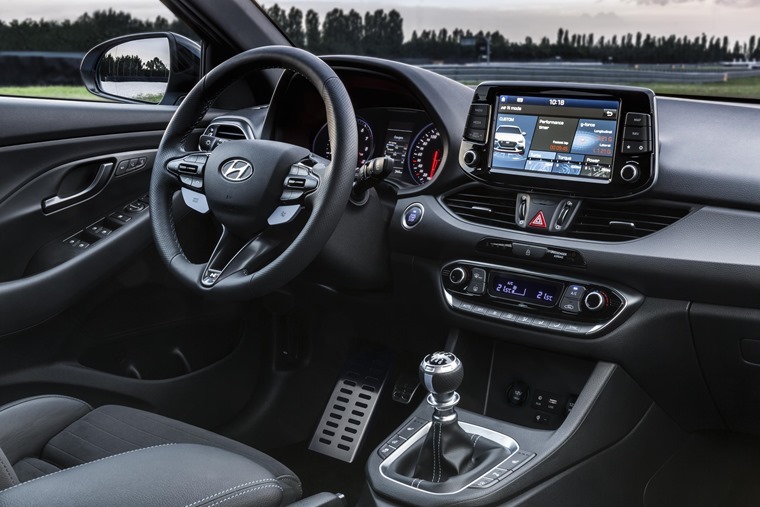 Perhaps as encouraging as anything else is the fact Hyundai has stuck with a six-speed manual gearbox for the N.
However, remember that Hyundai is entering uncharted territory for the company and wants to appeal to keen drivers, who generally prefer the interaction of a manual ’box. For them, this is a great idea even if it means the N is perhaps a fraction slower off the mark than it might have been with a twin-clutch transmission. But then, who cares too much about that? Hot hatches are about fun and engagement and plastering a smile across your chops when the road ahead is empty and twisty. 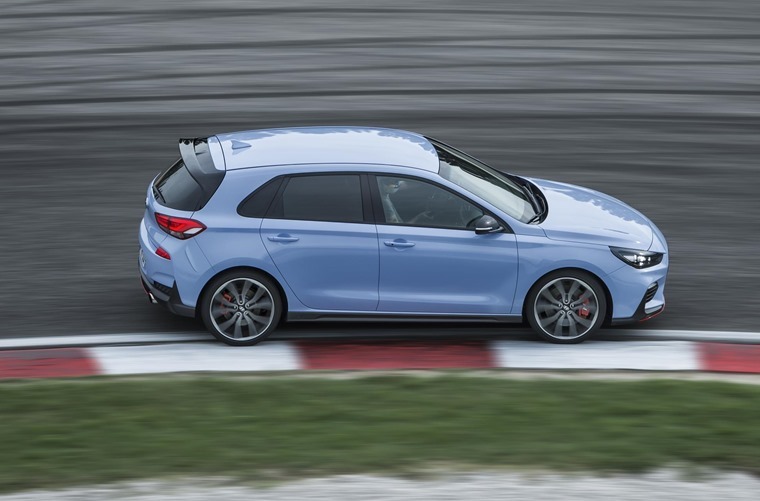 Here, all the signs are good for the i30 N, especially when the chassis and suspension have been developed by a chap called Albert Biermann, who is executive vice president, performance development and high performance vehicle division. That’s a very long title, but Biermann is more succinctly summed up by telling you he’s the former boss of BMW’s M Division. As such, Biermann knows more about setting up cars to be hugely entertaining and fun on road and track than almost anyone else. Biermann knows more about setting up cars to be hugely entertaining and fun on road and track than almost anyone else. 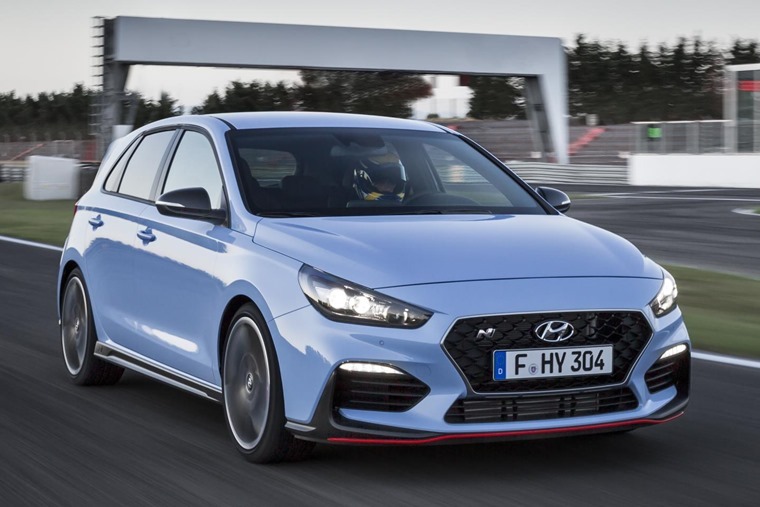 Anyway, he says: “The i30 N has been developed for no other purpose than to deliver maximum driving fun in an accessible, high performance package.” In other words, Biermann has summed up the whole hot hatch class in a single sentence and that bodes very well for the way this Hyundai will perform. Such clarity of thought and goal is what it takes to produce cars that stand out. Look at the Ford Focus RS and the way it was brought about in such a single-minded fashion. So this time next year we could very well be looking at a new hot hatch dynasty being born and its first effort upsetting the old guard. That’s a good thing in any sector, but in this affordable performance market it’s even more vital to keep the rest from getting lazy and fat, just as they did in the mid and late 1990s when the hot hatch was at its lowest ebb. 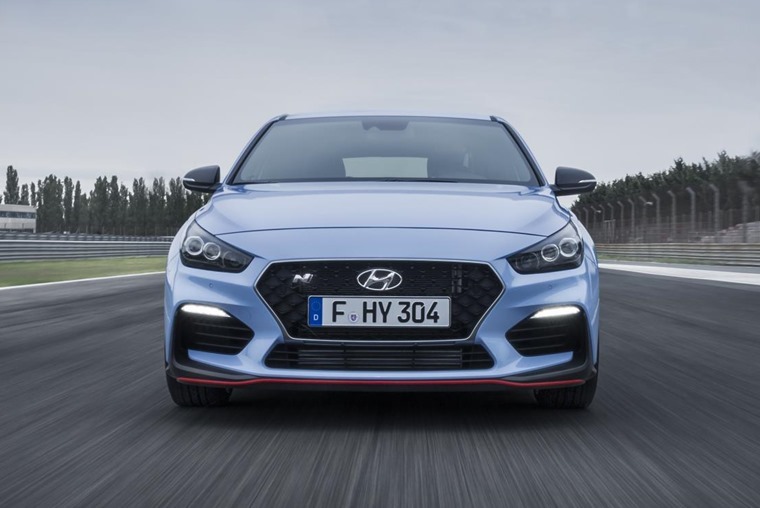 Regardless of what the ‘N’ stands for it in its name,Regardless of what the ‘N’ stands for it in its name, this fast Hyundai is a game-changer in both the company’s range, and the hot hatch class.